If you have ever wondered what it is like to race in a downhill then here is your chance to find out. First run in 1924, the Parsenn Derby is one of the oldest downhill races in the world and is open to amateurs. There are opportunities to race in both the team and individual events and at your fastest you will travel at speeds approaching 80mph. To get a better idea of what is involved then click here to see a video of the course. 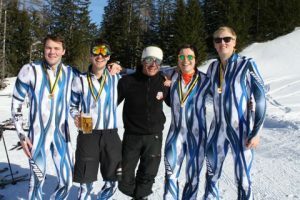 By way of background, the race was founded jointly by the Davos Ski Club and the Davos English Ski Club and was run from the Parsennfurka down to Kublis. In 1933 the start was moved to the Weissfluhjoch and with a length of 12.5km and a vertical descent of some 2000m this, became one of the most important events in the international ski world before the founding of the Ski World Cup. As a point of interest, James P-T’s grandmother Doris Friedrich won it in 1939! The race has been adapted to the modern day and no longer runs down to Kublis, the modern equipment and safety requirements rendering this impractical. Nonetheless two and a half minutes in the tuck is plenty long enough and every year some 4-500 ambitious skiers from near and far take part. To take part in the race you should be a strong black run skier comfortable skiing at fast speeds. There will be a warm up day on the Thursday and opportunities to do timed runs of the course on the Friday, before competing in the team event on the Saturday and individual on Sunday. Prices from £880 including 4 nights bed and breakfast in the Silvretta Parkhotel (based on 2 people sharing), complimentary transfers to and from Zurich Airport and race entry fee; does not include flights. 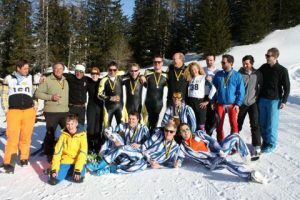 For more information on how you can take part in this thrilling race and to get a first hand account of what it is like to ski it call us now on 02077365557.